It was real honour for me to travel to Nairobi last weekend to attend the 2nd Africa Regional Scout Summit. 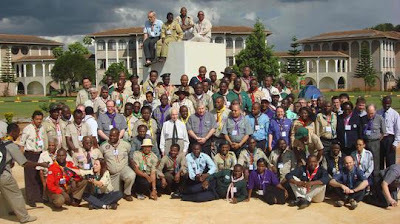 Almost every nation in sub Saharan Africa was represented and we were able to discuss the training and programme needs of Scout Organisations. There is some truly tremendous work going on in the region. I was privileged to have sight of some superb new programme material that will help young people understand malaria and how to prevent it; the really excellent materials being produced for the Scouts of Zimbabwe (which now needs funding to get it printed); the preparations for the World Scout Moot to be hosted in Kenya in 2010; a desire to work in co-operation across the region to help the development of young people; and, of course, the ways in which the region can contribute to Scouting’s mission worldwide. On the day after the summit, before travelling home and to a busy week at work, I was able to make a visit to Nyeri and to visit the grave of Baden-Powell. I also visited Paxtu, at the Treetops Hotel, where he retired and spent the last few years of his life. I had not realised that Paxtu was, in fact, just a couple of guest rooms in an annexe of the hotel, donated to him by the man who built the complex. A tremendous opportunity… even if I wish I had been able to spend longer than just four days in Kenya.